Carlos Arthur Nuzman is charged with paying members of some African Olympic Committees to have the city of Rio de Janeiro named as the host of the 2016 Games. 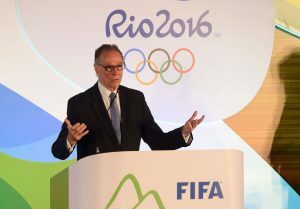 SÃO PAULO, BRAZIL – Federal Police in Brazil arrested Carlos Arthur Nuzman this morning (Thursday, October 5th), the president of the Brazilian Olympic Committee (COB), as well as the general director of the Rio 2016 Organizing Committee, Leonardo Gryner. President of the Brazilian Olympic Committee, Carlos Artur Nuzman, has been arrested for corruption in 2016 Rio Olympics, photo by Tania Rego/Agencia Brasil. The two are being charged with corruption and money-laundering in what is being called Operation Unfair Play. “While the Olympic medalists were looking for the much-desired gold medal in Brazil, Olympic committee leaders kept their gold in Switzerland,” prosecutor Fabiana Schneider, one of the officials responsible for the operation, said today in a press conference. According to the Federal Prosecutors’ office Nuzman and Gryner were intermediaries in a vote-buying scheme to have the city of Rio de Janeiro named as the host of the 2016 Olympic Games. The scheme was discovered when prosecutors investigating the mega Lava Jato corruption scheme started looking into former governor Sergio Cabral’s illegal activities. “The criminal organization led by the ex-governor Sergio Cabral, enlisted the aid Nuzman to obtain the votes of the African committee for Rio to win the chance to host the sports event,” stated the warrant issued by Judge Marcelo Bretas, one of the main judges looking into the Lava Jato (Car Wash) scandal’s Rio de Janeiro connections. According to the Federal Prosecutors’ Office, the temporary arrest of Nuzman was necessary because the COB president attempted to conceal property. According to prosecutors, last month, after Nuzman was questioned, he rectified his last income tax results to include sixteen 1-kg bars of gold, over €$66,000 and US$50,000, all deposited in Swiss banks. According to the MPF, in the last ten years Nuzman has increased his assets by 457 percent, without a clear indication of his income. Carlos Arthur Nuzman has been president of Brazil’s Olympic Committee for the past twenty two years. “The Olympic Games were used as a great stepping stone to corruption,” prosecutor Schneider was quoted as saying to monthly news magazine Carta Capital.